Hypertrophic cardiomyopathy (HCM) is a relatively common genetic disorder of the heart (affecting almost 1 in 500 people), that can cause several problems, including heart failure and sudden death. However, the severity of HCM is quite variable from person to person, and many people with HCM can lead virtually normal lives. HCM is caused by one or another of several genetic mutations that produce a disorder in the growth of the heart muscle fibers. HCM is passed on as an “autosomal dominant” trait, which means that if the abnormal gene is inherited from a single parent, the child will have the disease. However, in almost half the patients with HCM, the genetic disorder is not inherited at all but occurs as a spontaneous gene mutation – in which case, the parents, and siblings of the patient will not be at elevated risk for HCM. However, this “new” mutation can be passed on to the next generation. In HCM, the muscular walls of the ventricles (the lower chambers of the heart) become abnormally thickened - a condition called “hypertrophy.” This thickening causes the heart muscle to function abnormally, to at least some extent. If severe, the hypertrophy can lead to heart failure and cardiac arrhythmias. In addition, if it becomes extreme the hypertrophy can cause a distortion in the ventricles, which can interfere with the function of the aortic valve and the mitral valve, disrupting the flow of blood through the heart. "Diastolic dysfunction" refers to an abnormal “stiffness” of the ventricular muscle, which makes it more difficult for the ventricles to fill with blood in between each heartbeat. In HCM, the hypertrophy itself produces at least some diastolic dysfunction. If severe enough, this diastolic dysfunction can lead to diastolic heart failure, and severe symptoms of dyspnea (shortness of breath) and fatigue. Even relatively mild diastolic dysfunction makes it more difficult for patients with HCM to tolerate cardiac arrhythmias, especially atrial fibrillation. In LVOT, there is a partial obstruction making it difficult for the left ventricle to eject its blood with each heartbeat. This problem also occurs with aortic valve stenosis, in which the aortic valve becomes thickened and fails to open normally. However, while aortic stenosis is caused by disease in the heart valve itself, the LVOT with HCM is caused by a thickening of the heart muscle just below the aortic valve. This condition is referred to as "subvalvular stenosis. “ Just as with aortic stenosis, the LVOT caused by HCM can lead to heart failure. In mitral regurgitation, the mitral valve fails to close normally when the left ventricle beats, allowing blood to flow backward (“regurgitate”) into the left atrium. The mitral regurgitation seen with HCM is not caused by an intrinsic heart valve problem, but rather, is produced by a distortion in the way the ventricle contracts, caused by the thickening of the ventricular muscle. Mitral regurgitation is yet another mechanism by which people with HCM can develop heart failure. Ischemia -- oxygen deprivation -- is most typically seen in patients with coronary artery disease (CAD), in which a blockage in a coronary artery limits blood flow to a portion of heart muscle. With HCM, the heart muscle can become so thickened that some portions of the muscle simply do not receive enough blood flow, even when the coronary arteries themselves are completely normal. When this happens, angina can occur (especially with exertion), and a myocardial infarction (death of heart muscle) is even possible. Sudden death in HCM is usually due to ventricular tachycardia or ventricular fibrillation and is typically related to extreme exertion. It is likely that ischemia of the heart muscle produces many if not most of the arrhythmias that lead to sudden death in patients with HCM. For this reason, most patients with HCM need to restrict their exercise. The symptoms experienced by people with HCM are quite variable. 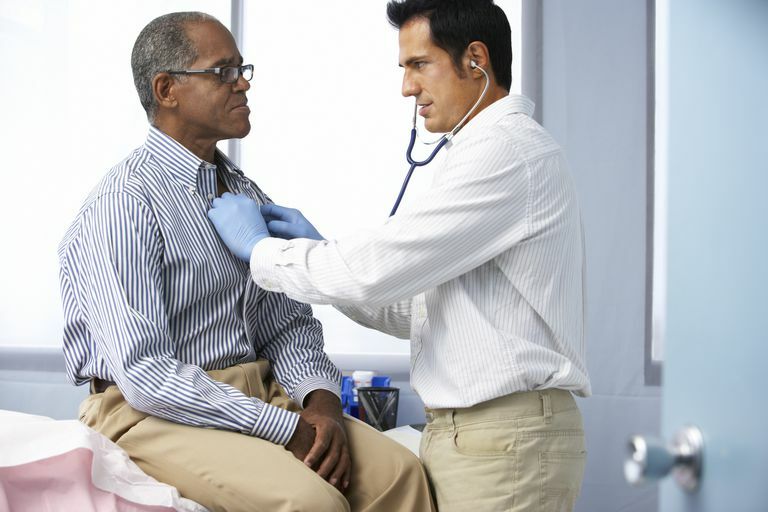 It is common for patients with mild disease not to have any symptoms at all. However, if any of the heart problems just mentioned are present, at least some symptoms are likely. The most common symptoms experienced by patients with HCM are dyspnea with exercise, orthopnea, paroxysmal nocturnal dyspnea, palpitations, episodes of lightheadedness, chest pain, fatigue or swelling of the ankles. Syncope (loss of consciousness) in anyone with HCM, especially if it is associated with exercise, is a very serious matter, and may indicate a very high risk of sudden death. Any episode of syncope needs to be evaluated right away by a doctor. In general, the echocardiogram is the best method of diagnosing HCM. The echocardiogram allows accurate measurement of the thickness of the ventricular walls and can detect LVOT and mitral regurgitation as well. The electrocardiogram (ECG) can reveal left ventricular hypertrophy and has been used as a screening tool to look for HCM in young athletes. Both an ECG and echocardiogram should be performed in close relatives of anyone diagnosed with HCM, and an echocardiogram should be performed in any person in whom the ECG or the physical examination suggests ventricular hypertrophy. HCM cannot be cured, but in most cases, medical management can control symptoms and improve clinical outcomes. However, the management of HCM can become quite complex, and anyone who has symptoms due to HCM should be followed by a cardiologist. Beta blockers and calcium blockers can help reduce the "stiffness" in the thickened heart muscle. Avoiding dehydration is important in patients with HCM in reducing symptoms related to LVOT. In some patients, surgery to remove portions of the thickened heart muscle is necessary to relieve LVOT. Atrial fibrillation, if it occurs, often causes severe symptoms and needs to be managed more aggressively in patients with HCM than in the general population. HCM is the most common cause of sudden death in young athletes While sudden death is always a devastating problem, it is particularly so when it occurs in young people. For this reason, extreme exertion and competitive exercise should be restricted in patients with HCM. Many methods have been tried for reducing the risk of sudden death in patients with HCM - including using beta blockers and calcium blockers, and antiarrhythmic drugs. However, these methods have not proven sufficiently effective. It now seems clear that, in patients with HCM whose risk of sudden death appears high, an implantable defibrillator should be strongly considered. Massie, BM "Heart Failure" in Goldman L and Ausiello D (Eds). Cecil Textbook of Medicine, WB Saunders, 2003. Nishimura RA, Holmes DR Jr. Clinical practice. Hypertrophic obstructive cardiomyopathy. N Engl J Med 2004; 350:1320. Gersh BJ, Maron BJ, Bonow RO, et al. 2011 ACCF/AHA guideline for the diagnosis and treatment of hypertrophic cardiomyopathy: executive summary: a report of the American College of Cardiology Foundation/American Heart Association Task Force on Practice Guidelines. Circulation 2011; 124:2761.